As kids, many NHL stars looked forward to the holidays because it meant they’d be hitting the motherlode: new gear. For Connor McDavid of the Edmonton Oilers, Nathan MacKinnon of the Colorado Avalanche and two-time Olympic medalist Natalie Spooner of the CWHL Toronto Furies, there was no better moment than rising on the morning of Dec. 25 and finding a coveted new stick, the blade’s curve fashioned after their favourite player, waiting for them under the tree. It was a little different for Marc-André Fleury, the Vegas Golden Knights goaltender. Instead of a stick, he remembers getting his first set of new pads. The luckiest players, however, didn’t have to wait for the holidays. Canadiens forward Max Domi could just grab one from his dad, Tie. In the Subban household, they were a year-round necessity, so P.K. never had to put one on his wish list. From wooden twigs to the two-piece aluminum shaft to the ubiquitous one-piece composite, here are some of the game’s top players reflecting on their favourite sticks (and other holiday memories). Connor McDavid and family. (File Photo). Connor McDavid never coveted a Red Ryder air rifle as a gift, like Ralphie Parker did in the holiday film A Christmas Story. As a child, hockey’s greatest player would go to bed with visions of a new stick in his head. He was 7 when he got his first stick as a Christmas present, a lightweight orange Easton Synergy model. “I remember being concerned because I was afraid he wouldn’t like the colour,” says McDavid’s father, Brian. A year later, the future Edmonton Oilers captain received the stick of his dreams at Christmas from his father and mother, Kelly. It is a memory he cherishes. The jubilation he felt can be seen in the future superstar’s face as he and his brother, Cameron, four years older, pose beside the Christmas tree in a family photo taken in 2005. Connor wanted to try the stick as soon as he saw it, but was forced to wait until his team in the Toronto suburbs participated in a holiday tournament a few days later. “He couldn’t wait to use it,” Brian McDavid says. The eight-year-old racked up five points with it in the first game he played. Connor loved it so much, that his father let him keep using it. Brian would simply change the blade on the shaft when it wore out. Connor and Cameron would receive a stick for Christmas nearly every year. If it broke after that, negotiations would occur before they got a new one. There was never any question what Sean Monahan wanted for Christmas as he grew up. He was 12 when he asked for a yellow Easton Synergy model. He was so worried he wouldn’t get it that he spent a sizable amount of time snooping around his family’s house in Brampton in search of it. He knew his parents’ favourite hiding places; he could find no hockey stick at all. “I remember coming downstairs on Christmas morning and looking forward to getting it,” Monahan, now 24, says. He did indeed receive one – but it was not the stick of his preteen desire. “My dad got me a lesser one,” he says, chuckling at the memory. Despite his disappointment, he grabbed it and headed for the backyard rink where he spent so many hours in his youth. No matter, he ended up being chosen by Calgary in the first round of the 2013 NHL draft, and now serves as the Flames alternate captain. Mark and Michael Stone both dreamed of one day reaching the NHL – a dream that is reality today with Mark, 26, a forward with the Ottawa Senators and Michael, 28, on defence for the Calgary Flames. In summer they set up their nets in the long driveway of their home in the Westwood neighbourhood of Winnipeg and fired tennis balls at each other. In winter, it was pucks. At least twice parents Rob and Jackie Stone had to replace the garage doors. One cold December day, about a week before Christmas, they raised those garage doors to get out the nets – and stumbled upon their presents. “I actually remember catching my dad trying to hide it,” Mark says of the brand-new, blue Easton SL Synergy, right shot, he’d been hoping would show up under the tree. Michael’s stick was also a new Easton, the Stealth model, also right shot. A few days later, they woke to find the sticks under the tree. “We tried to act surprised,” Mark says with a laugh. Brad Marchand grew up just outside of Halifax and was chosen by the Bruins in the third round of the 2006 entry draft. He wanted, and got, for Christmas the same stick many players of his era coveted. Mark Scheifele would awake early on Christmas and race downstairs with his older siblings, Janelle and Kyle. Santa did not leave their presents beneath a balsam but beside a fireplace in the basement of the family home. It was there, at age 12, that the future NHL centre found the hockey stick of dream: a black Bauer Vapor 20 with bluish and silver lettering, leaning against the bricks. Kyle, two years older, also played hockey. “Because of that, I always got a lot of hand-me-downs,” Scheifele says. Like Connor and Cameron McDavid, he and Kyle would often engage in pitched battles of mini-sticks and road hockey. Once, like Connor, the frantic competition between them sent Mark to the emergency room. “Because there were three of us, my parents didn’t always have a lot of money,” says Scheifele, now 25. “My brother and I would get gloves and pads as needed, or pants when we grew out of them, but hockey was always a big thing for us at Christmas. Johnston remembers seeing it wrapped under the Christmas tree – the first brand new hockey stick she would ever own. She was the fourth-born of six kids, with two older sisters, an older brother, and two younger brothers. They all played several sports, but hockey was their favourite. Johnston, who began playing several years earlier when she was 4, had used only wooden hand-me-down sticks to that point. But the one she opened that Christmas was a silver composite Easton Synergy stick. She can’t recall exactly how old she was, but this was the early 2000s, as composite sticks had become popular. She couldn’t wait to show it to her teammates on a boys’ minor-hockey team in Sudbury. Johnston, 29, extended the life of that beloved stick as long as she could. She cut off the bottom and replaced the blade several times. She added different wood extensions to the top so the stick could grow with her. Today, the three-time Canadian Olympic medalist is sponsored by CCM and has access to a variety of sticks all the time. She’s experimented a little with different curves in practice, but that slight curve from her childhood remains her go-to. So where is that old Easton Synergy now? Sidney Crosby came of age during the aluminum-stick era, when Easton partnered with Wayne Gretzky to release what became an iconic silver shaft endorsed by The Great One. That ushered in a mass popularity of two-piece sticks. “Back then two pieces were the big thing when I was younger. As you get older the one-piece stick was just coming out. The Gretzky aluminum was pretty heavy, but it's the one he used. Everybody wanted that. “One year I got it. It was the first time I got a two-piece. I was using a wood stick for a long time,” says Crosby, 31. Troy Crosby, the father of hockey’s most famous player, says Sidney would go through about six sticks a year at that stage and it was up to Troy to keep them in stock. Sometimes that meant a lot of driving around Cole Harbour, Dartmouth and Halifax. It also meant Sidney did not often get them as Christmas gifts. “I’d have to go buy them,” Troy says. “They were expensive even back then. I think about $35 [each]. Sometimes the sports store I’d go to would be sold out of them. So I’d have to drive around the city looking for them. Natalie Spooner and her coveted new stick. (File Photo). Since she was a right-handed shooter, sticks were the one piece of hockey equipment Natalie Spooner didn’t have handed down from her three older brothers, all lefty shots. With some seven years of hockey under her belt already, Spooner was about 12 when she received what would become the most beloved stick of her youth. It had glossy black paint with yellow and white lettering that read TPS Rubber. 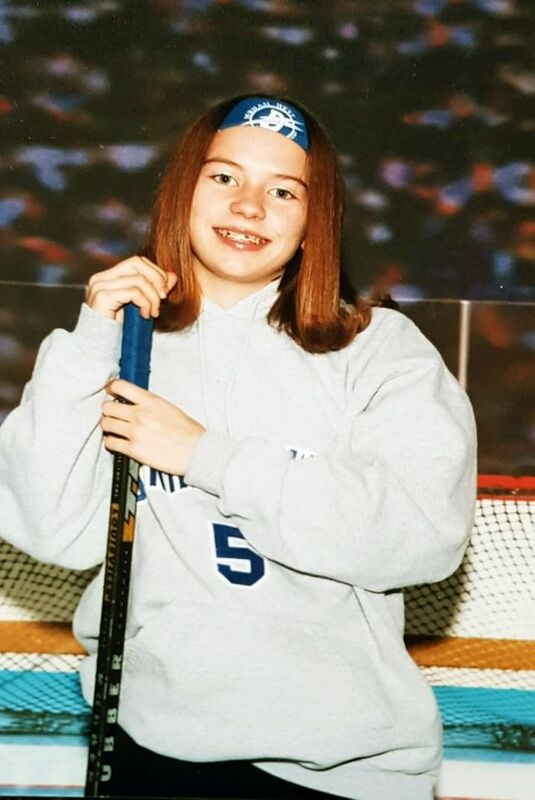 The native of Scarborough, Ont., was a hockey-crazed kid playing for the Durham West Lightning Girls and giddy to get her first non-wooden stick. She was intrigued by this stick she saw as quirky and innovative. Its entire shaft was coated in thin rubber, making it unlike anything Spooner had used. Spooner had to buy the blade separately for that particular stick, and she chose one with a slight curve pattern, one then named in the marketplace for the preferences of NHLer Mike Modano. Spooner learned a lot about her style from that stick. Today she still uses a modest curve, a pattern that has since also been named after Peter Forsberg and Henrik Zetterberg. Her sticks today have a clear coating that provide some stickiness to the grip. Joe Thornton remembers holding out hope that he’d find a new stick under the tree on Christmas morning. “You were a kid and Santa thought you were a good boy so I was a happy little kid,” says Thornton, 39. Unlike the current generation of young NHL stars, who grew up on one- or two-piece sticks, Thornton was raised on the wooden variety. He based his stick decisions as a child on what his heroes Wayne Gretzky and Mario Lemieux were using. Patrick Marleau, 39, grew up on a farm where he started playing hockey. That led to a 21-year NHL career and more than 1,600 games played. “One Christmas I got a Koho Mario Lemieux stick and until this day I still remember that. I’m not really sure why that has stuck with me. Probably because I wanted it so bad, I guess, and then I got it. “There was another one when I was playing minor hockey from Geoff Sanderson, who was playing for the Swift Current Broncos. I was at one of his games and I asked for his stick and he gave it to me. I was going to save it but I couldn’t help myself and I started to use it in my games. I could shoot awesome with it. 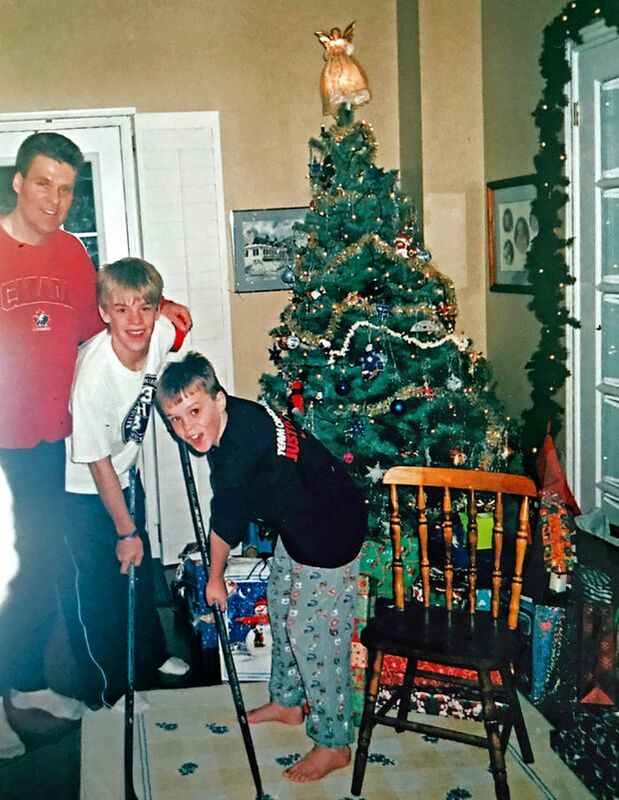 Nathan MacKinnon was not surprised to receive a stick at Christmas when he was a kid. His father, Graham, and mother, Kathy, gave him one every year. It wasn’t so much a gift for young Nathan as it was an essential tool. He started to skate when he was 2 and within a few years of playing hockey was identified as another great player to come from Cole Harbour, N.S., also the hometown of Sidney Crosby. The MacKinnon family lived rather modestly, so it was a big deal for Nathan to find a hockey stick beneath the tree. “It is hard for me to pick out one as more special than any other because they were all so cool to me,” says MacKinnon, 23. “Every year, I would be excited and so thrilled. And then his father, Graham, a former junior hockey player, would give him another. “My dad was the best for this,” MacKinnon says. The object of yuletide yearning for one of hockey’s best netminders was not a stick. Naturally, it was goalie pads. Marc-André Fleury was probably 8 before he got his first pair. For three years before that, he borrowed gear from the shop at the rink in Sorel-Tracy, his hometown on the St. Lawrence River about 90 kilometres from Montreal. He found the pads wrapped up in a box and soon after was out in the street trying to deflect shots made by his sister, Marylène. “They weren’t my favourite colour,” says Fleury, 34, who won three Stanley Cups with the Pittsburgh Penguins. “They were brown pads, and kind of ugly. The son of former NHL tough guy Tie Domi, Max never lacked for a hockey stick. He doesn’t recall having received one for Christmas. He is now 23, but says he remains as excited as he was as a kid on the morning of Dec. 25. He would sometimes receive hockey equipment for Christmas, but he was happy with whatever Santa brought him. There were no hockey sticks under the tree in the Subban household. It was so much a part of daily life that Santa Claus was unlikely to deliver a fancy hockey stick to the Toronto-raised future Norris Trophy winner or his hockey-playing brothers Malcolm and Jordan. “My parents never got me hockey equipment for Christmas,” says Subban, 29, who is famous, of course, for random acts of kindness during the holiday season, including throwing Christmas parties for sick children. “Hockey was something I loved to do and it was fun, but getting equipment would have been like getting school supplies. Christmas means more to him than many. He says two years ago, when his niece celebrated her first, ranks among his favourites. “Being able to see her at her first Christmas brought back a lot of memories of my own,” he says. Canada’s leading scorer at the 2018 Pyeongchang Olympics can’t recall the make or colour of the first hockey stick she received when she was 5, but she sure remembers using it. There were no girl’s hockey teams in her hometown of Valleyfield, Que., so Daoust’s parents put her in figure skating lessons when she was 4. She begged to play hockey instead, like her brother and dad. So the next fall, her parents surprised the girl with a set of hockey equipment and signed her up. She scored her first goals with that wooden stick and fell in the love with the sport. Its blade had almost no curve, and Daoust believes that had a hand in shaping her game. Today, Hockey Canada pays for Daoust’s sticks, and they’re shipped directly to her home, with blades factory-customized and her name printed on them. Even after gold and silver Olympic medals, she said she’s still overcome with child-like excitement and gratefulness every time a shipment arrives. The CCM-sponsored player plans to give her three-year-old-niece Olivia her first set of hockey equipment this Christmas, complete with a stick. The Staal family home in Thunder Bay was always busy, but at Christmas it became crazy. As they played mini-sticks, the four hockey-playing Staal brothers would bang pucks up and down the hallway and take over the living room. “It was a very special time of the year,” says Eric Staal, at 34 the oldest sibling. He is a centre and alternate captain with the Minnesota Wild. His brothers Marc and Jordan also play in the NHL and Jared, the youngest, once did. It wasn’t receiving a hockey stick for Christmas that the Staal boys most looked forward to. It was the hockey game on the family’s huge backyard rink on Dec. 25. “My mom was one of nine kids, and all of our cousins and uncles would come to play,” Eric Staal says. “That is the greatest memory of Christmas that I have today.